It was expected that the English translation would be cleared in 2007. A new translator, Duncan Hewitt, a journalist in China since 2002, correspondent for the BBC and for Newsweek, had to start again. 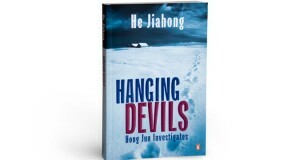 The novel was finally published a few months ago under the title “Hanging Devils.” This is in my opinion his best novel both for the quality of the plot and the surroundings, the far north of China, Heilongjiang, a region that the author is most familiar with as he was sent there as “educated youth” and stayed eight years on a farm. He even mentions Oroquen and Evenki hunters, nomadic reindeer herders that Chi Zijian portrayed in a beautiful novel “The last quarter of the moon” recently published by Penguin. In 1979, He Jiahong was admitted to the Faculty of Law of Renmin for the sake of his future wife, a doctor whose parents were concerned about a bridegroom without university education. He also spent several years in the United States and wrote his thesis in English. He has an international dimension that few Chinese writers have. 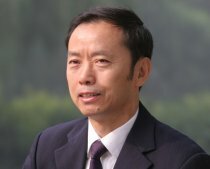 His professional practice also had a great impact on his novels as shown by an interview published by The China Story. His five novels were published in Beijing in 1996-1997 and four of them in France from 2002 to 2005.They have also been reissued in paperback in 2011. After fifteen years with his legal career, he begins to take an active interest in his novels: he has reviewed the texts and they were published again in China. He prepares with Penguin the release of a second novel in English, translated by Emily Jones. As for Editions de l’Aube, they will publish next month in French his fifth novel “Unpunished Crime in the Wuyi Mountains,” translated as his previous books by Marie Cantournet-Jacquet. During our meeting, he indicated that he had no time to write, but that he was collecting elements for… later; in recent interviews, he does not rule out new books, specially as he is now 60 with maybe less work pressure.